Really! I really do not like sweet stuff. The problem? There are all these great boutique shops popping up that are so adorable inside, I can’t resist. Then I feel the need to support a local, new business…so I buy something. Sigh. 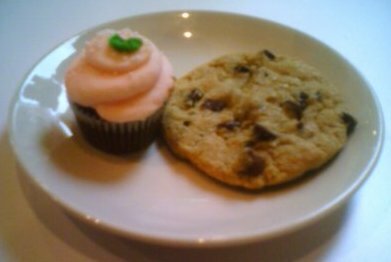 Today I had a mini strawberry cupcake and a chocolate chip cookie. Why couldn’t I stop at mini cupcake? Because someone behind me said “Oh my gosh! This is the chewiest, most savory chocolate chip cookie that’s ever touched my lips.” Well, there solves the “I don’t like sweets” problem. Savory? Chewy? I stand no chance. The Chocolate Box just popped up a couple of blocks from my office. A co-worker and I walked over for a late afternoon snack, it was fun! The best part is the pig outside. He’s all dipped in chocolate and his quote is “Happy as a pig in mud, or better yet, chocolate!” He is by far my favorite of the Pigs on Parade this year. What I can’t figure out is why he is wearing that mask. Did he break into the chocolate shop and eat it all in the middle of the night? 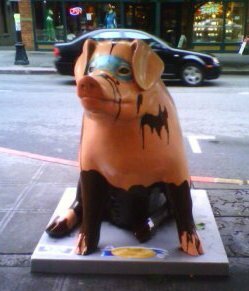 Why, pig?